How's that for a recipe title? I was inspired once again by the menu at Plus Minus Café in Mont Tremblant. I know most people's favorite cake flavor is chocolate, but I love vanilla. And this one contains passion fruit (my all-time favorite fruit), orange and vanilla. I've been playing around with baking cakes in different fruits lately. This time, I thought it would be fun to bake the vanilla white cake inside an orange shell so that the shell would infuse the cake. The frosting I used is a favorite of mine that is light, airy and can take on any flavors you throw into it, including cinnamon and nutmeg or passion fruit and orange. This is my submission to Sugar High Fridays, a dessert-focused food-blogging event created by fellow Canadian and food blogger extrodinaire Jennifer from The Domestic Goddess. This month's event is hosted by the amazing and inspiring Fanny from Foodbeam. This half recipe makes 1 dozen cupcakes. To prepare the orange shells: Slice off the top of the orange and use a grapefruit spoon to clean it out. Center a rack in the oven and preheat the oven to 250°F. Bake the shells for 1 hour, until they are dried out. Transfer the orange shells to a cooling rack and let cool to room temperature. To get ready for the cupcakes: Center a rack in the oven and preheat the oven to 325°F. To make the cupcakes: Sift together the flour, baking powder and salt. Working with a stand mixer, preferably fitted with a whisk attachment, whisk the egg whites and cream of tartar (if using) until soft peaks form. In another bowl, working with a stand mixer fitted with the paddle attachment, beat egg yolks until thick and lemon colored. Gradually, beat in sugar. In a small bowl, mix the water, vanilla, passion fruit, and orange. Reduce the mixer speed to low and add the dry ingredients alternately with water and flavorings, adding the dry ingredients in 2 additions and the water mixture in 1 (begin and end with the dry ingredients). Scrape down the sides of the bowl as required and mix only until the ingredients are absorbed into the batter. The batter will be thick. 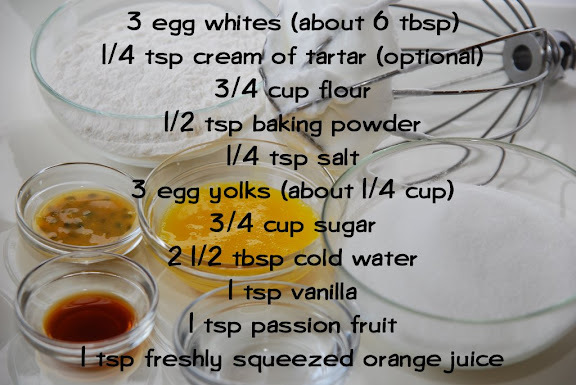 Using a rubber spatula, fold the egg whites into the cupcake batter in 3 additions. Using a piping bag, fill the cupcake shells (or orange shells) ¾ full. To bake the cupcakes: Bake for 25-30 minutes, until the cupcakes are golden on top and a thin knife inserted into the center comes out clean. Transfer the cupcakes to a cooling rack and let cool to room temperature. When cool, the cupcakes can be wrapped and kept at room temperature overnight. To make the frosting: Combine the sugar and water in a small saucepan. Boil the mixture until it reaches 248˚F (120˚C) on a candy thermometer. While the sugar is melting, working with a stand mixer, preferably fitted with a whisk attachment, whisk the egg whites until soft peaks form. Reduce the mixer speed to medium. While beating the egg whites, carefully drizzle the hot syrup into the bowl, pouring it between the spinning beater(s) and the sides of the bowl. Increase the mixer’s speed to high and beat the egg whites until cool (but not too much or the mixture will separate). Frost the cupcakes and drizzle with reserved passion fruit. These cupcakes have a delicate crumb, light and fruity taste, and are perfect for a shower or afternoon tea. If you want to serve them in the orange shells, give your guests a spoon to eat it with because the orange shell gets hard and difficult to peel without using a pair of scissors. But, as they say "It is better to look good than to feel good." See Passion Fruit and Orange Fluffy Sponge Cupcake with Marshmallow Vanilla Frosting on Key Ingredient. I'm drooling on my keyboard. Those look fab Shari! holy smokes. this is crazy delicious! i love, love passion fruit. Gorgeous. Creative. and Passionfruit is one of my favorite things! Mmmmm... baking the cupcake in an orange! How fun is that? Love it! You are just too creative!! I made a creme brulee in a hollowed orange a while ago, but that is very cool baking the cake in the shell. Great idea! what a clever idea! I am sure the cupcakes taste wonderful, with citrus infused scent. Too bad passion fruit is not available in my neck of the wood. 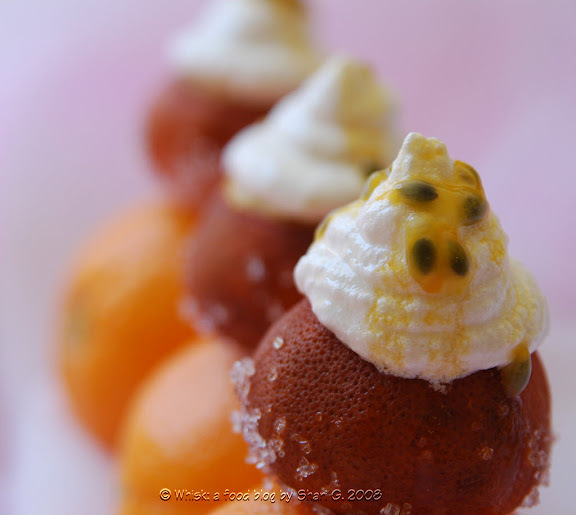 I would love to make this recipe when luck hands me some passion fruits! baked in an orange--that is so cool! you are very adventurous in the kitchen! 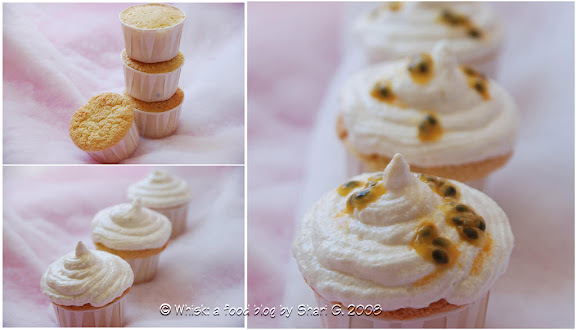 i love passion fruit and meringue, so i bet these are right up my alley! I am completely speechless at the sight of this delicacy. It is so stunning!!!!! nikki - food and computers don't always go together! Careful! the food librarian (Karen) - I wish I could get passion fruit at the store more regularly! gretchen - I bet you have access to passion fruit more readily where you are!! I'm envious! clara - Although it was hard to dig the cake part out, a spoon worked fine. It's also best eaten soon because the longer the cake sits in the fruit, the more moisture it absorbs. phemom (Holly) - I have to check out your creme brulee! Will we see that from you next week too?? Can't wait. mandy - We don't get it here very often either, but when I see it, I buy a bunch (even tho' they're SO expensive)! steph - Can you get passion fruit easily where you are in Australia? nina - Thanks for stopping by! What about for you? Are passion fruits easy to come by in South Africa?? Wow, I come here this morning thinking I'll find my quazillioneth dimply plum cake, but no... cupcakes baked in orange peels? You are getting freakier by the minute! LOL LOL Gotta try this sometimes... womder how it would turn out if drenched with liquor after baking... eaten with a little spoon!? Mmmmm... funky ideas in perspective! THANKS for sharing, Shari!!! I am loving this! I adore passionfruit! These look great! I have been looking everywhere for passionfruit in san francisco - we are so jealous! vibi - I love your idea of drenching it in liquor and eating it with a spoon! my sweet & saucy - Glad to find more passion fruit lovers out there! chezus - I guess Ottawa has one thing it can claim better than SF!